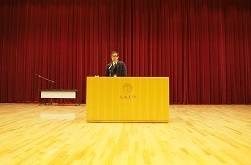 Each year, in recognition of important achievements toward progress in physics, the Physical Society of Japan (JPS) selects outstanding papers from among original research articles published in the Journal of the Physical Society of Japan, Progress of Theoretical Physics, Progress of Theoretical and Experimental Physics, and JPS Conference Proceedings. The selection committee has chosen the following five papers for the 2019 award based on 16 nominations (15 papers) made by the editors of the two journals and representatives of the 19 divisions of the JPS. 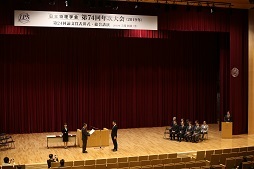 On the morning of March 16, 2019, the 2019 award ceremony was held at Shiiki Hall, Kyushu University. The effects of crystallographic symmetries on superconductivity have attracted considerable research attention recently. In particular, the consequences of the absence of the inversion symmetry on superconductivity have been vigorously examined. In this study, the authors further developed this trend by theoretically studying superconductivity in layered materials that have an inversion symmetry but also possess some layers that do not coincide with mirror planes. In these types of systems, the lack of a mirror symmetry on these planes results in an effective modulated Rashba spin-orbit interaction, which produces various physical effects. The authors found that the induced Rashba spin-orbit interaction considerably increases the upper critical field of superconductivity. This well explains experimental observations in artificially engineered heavy-fermion superlattices based on CeCoIn5 as well as in BiS2-based layered materials. Furthermore, the induced Rashba spin-orbit interaction as predicted in this study has recently been directly confirmed by an ARPES measurement in LaO0.55 F0.45BiS2. This study opens the possibility of controlling properties of materials, such as their superconductivity, by locally destroying the inversion symmetry. Indeed, some of the predictions suggested in this study have already been verified in a recent experiment With the recent developments in artificial engineering of lattice structures, we expect that the importance of this study will increase. For these reasons, we conclude that this paper deserves the Outstanding Paper Award of the Physical Society of Japan. This study reports on fundamental research on the magnetism of the parent material of iron-based superconductors discovered by the Hosono Group in 2008. Through precise measurements and analysis of magnetic resonance, the authors clarified that the As nucleus works as an excellent probe of the electronic states of this system and found that the antiferromagnetic transition of this system is of first order. Researchers of magnetic resonance for other iron-based superconductors make wide use of the hyperfine interaction tensor that is determined from the authors' analysis based on the assumption of a magnetic structure revealed by neutron scattering. In addition, the authors detected from the change of the electric field gradient the structural phase transition that occurs simultaneously with the antiferromagnetic phase transition. This represents pioneering research on the nematic phase transition in the present system, which has become popular now. Because the year of 2008 was when the superconducting state was discovered in the iron-based compounds, many researchers focused on elucidating this state. However, this study focused on the magnetism of the parent material by taking one step back from superconductivity and establishing a foundation for the study of iron-based superconductors. Thus, we conclude that this paper deserves the Outstanding Paper Award of the Physical Society of Japan. This study theoretically predicted that a topological line node emerges as a result of the mirror-reflection symmetry in the band structure of noncentrosymmetric material CaAgX (X = P, As) in the absence of spin-orbit interaction. Combining analytical theory based on topology with first-principle electronic-state calculation, the authors produced a qualitatively clear and quantitatively reliable prediction. Although this is not the first theoretical report on the topological line node protected by mirror-reflection symmetry, The fact that the authors specified the material group of CaAgX has been highly evaluated in terms of discovering a new topological material group as well as finding a means to verify experimentally the physical effects of line nodes. In 2018, the authors experimentally verified line nodes in a CaAgAs single crystal through angle-resolved photoemission spectroscopy. Thus, in recognition of this study having identified a new topological material group that was later experimentally verified, this paper deserves the Outstanding Paper Award of the Physical Society of Japan. Machine learning, particularly its variation known as deep learning, has shown tremendous progress recently. Its remarkable success in numerous practical applications such as image recognition is notable. The mechanisms of machine learning may be related to statistical mechanics, which deal with many interacting elements. Although several attempts to understand machine learning based on statistical mechanics have been made, this problem remains unresolved. This study applied deep learning to a quantitative analysis of quantum phase transitions, which is one of the most fundamental problems in statistical mechanics. As a concrete problem, the authors studied the localized-delocalized transition of a single particle in random potentials. For two-dimensional random potentials with symplectic symmetry, single-particle eigenstates are known to exhibit the Anderson transition, which is a quantum phase transition between a delocalized (metallic) phase and a localized (insulator or Anderson-localized) phase. Energy eigenfunctions in the delocalized phase spread over the entire system just as plane-wave states do in a free space. By contrast, energy eigenfunctions in the localized phase are localized in a finite region. However, distinguishing these two cases from numerically obtained eigenfunctions in small systems is not easy. In this study, the authors regarded the probability distribution (absolute value squared of the eigenfunction) as an "image" to which machine-learning techniques for image recognition were applied. They successfully demonstrated that the two phases can be distinguished from eigenfunctions in a relatively small system. Although some previous studies on applications of machine learning to the detection of phases or phase transitions have been conducted, the success of this study on the Anderson transition, as well as the topological phase transition between a Chern insulator and an Anderson-localized phase, established this study's usefulness. Globally today, applications of machine learning to statistical mechanics are being vigorously studied. As a pioneering study that provides a foundation for an active field of research, this paper deserves the Outstanding Paper Award of the Physical Society of Japan. The supersymmetry theory predicts that Majorana fermions exist. Recently, the search for these hypothetical elementary particles as quasiparticles in topological matters has attracted considerable attention from the viewpoint of fundamental physics and applications to topological quantum computation. The 3He-B phase is a time-reversal invariant topological superfluid with Cooper pairing in the Balian-Werthamer state that has a spin triplet p-wave symmetry. Majorana fermions are theoretically expected to emerge at surfaces of 3He-B. Recent experiments suggest the existence of these types of quasiparticles when measuring the surface Andreev bound state at an interface between 3He-B and a solid. This study succeeded in developing a unique and sophisticated technique to measure the mobility of negative or positive ions trapped in a two-dimensional plane 20-60 nm beneath a free surface of 3He-B. With the aid of this technique, the authors found that ion mobilities, which are dominated by quasiparticle scattering, do not depend on the depth of the ions, and they concluded, after carefully considering various spurious effects, that this should be an intrinsic property of the system. Quite recently, this apparently strange result has been quantitatively and theoretically explained by considering the scattering cross section at the quasi-bound state around the negative ion that is actually an electron bubble. This means that the measured depth-independent mobility does indicate the existence of surface Majorana fermions. The authors also measured the ion mobility of both the B phase and chiral superfluid A phase in a much wider temperature range (250μK ≤ T ≤ Tc = 930 μK）than in previous works. They found that the temperature dependences near Tc are consistent with theoretical calculations that consider the p-wave coherence in scattering of Bogoliubov quasiparticles for both the B and A phases, particularly for negative ions. In conclusion, through this newly developed technique that uses two-dimensional ion systems trapped just beneath a free superfluid surface, this study provides further experimental support for the emergence of Majorana fermions protected by time reversal symmetry in topological superfluids and is, thus, a major contribution to the field. Therefore, we conclude that this paper deserves the Outstanding Paper Award of the Physical Society of Japan.